Innovation continues to be a key determinant of the success or failure of organizations - and technology development continues to be the single most important type of innovation for most government agencies and firms. During the past two decades, the information technology (IT) industry has emerged as a powerful driver for standards, best practices, and formal, certification-oriented training in the management of programs and projects of all sizes. Surprisingly, in other areas of technology different organizations today continue to manage R&D efforts in widely varying ways. This is true of innovation programs within government agencies, companies large and small, or universities. In many situations, variations in management practices are explained as being due to differences in the objectives of the R&D program being managed. And, sometimes this explanation has some legitimacy; it is unlikely, after all, that one should use exactly the same practices for managing fundamental level-of-effort research that one would use for a major, schedule-driven systems-technology demonstration project. However, across various organizations and R&D programs, a number of similar tools and methodologies have been employed to improve the overall quality of management of - and the outcomes resulting from - innovation investments. These have varied from fairly loose processes for more ‘research discipline push’ investments to far more structured methods for more focused technology development investments. However, as is true in the case of program and project management, it is still possible to define for more general technology management a set of best practices that - if used as a reference point-of-departure - can enable many organizations to manage more effectively there innovation investments. The attached white paper (TO BE PROVIDED - circa Summer 2009 provides an initial concept for a coherent end-to-end architecture for defining and using a specific set of technology R&D management tools and methods - the Technology Management Body of Knowledge (TMBoK). The emphasis is on technology R&D investments that are tightly focused on a series of specific future systems developments and applications. The figure below provides a high-level summary of the annual process that frames the TMBoK architecture. Successful technology management must be highly adaptive to changing events and circumstances, and resilient in the face of the unexpected. Nevertheless, a clear framework for critical processes is essential to cost-effective innovation management. 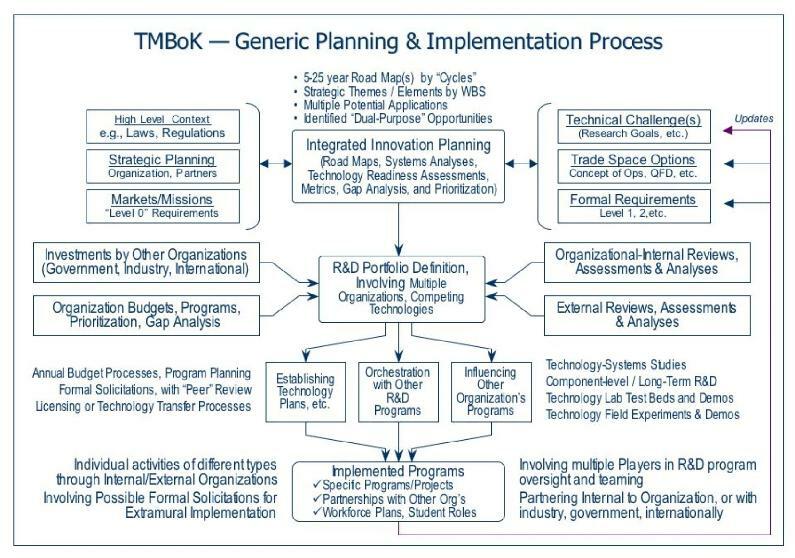 TMBoK provides an end-to-end approach for innovation R&D planning and implementation, ranging from preliminary conceptual studies, through more consistent assessments of technology maturity and risk, and to an improved understanding and management of the technology uncertainty-related differences among advanced technology systems alternatives. Of course, it is planned that TMBoK will be a ‘living’ body of knowledge—evolving and growing over time. Please contact us: comments are welcome on this initial architectural concept or on other related topics.